I've said it before and I'll say it again...I love squash. 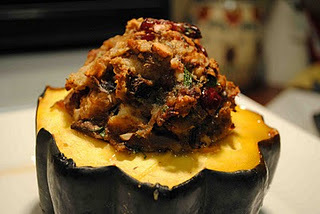 I have a number of stuffed acorn squash recipes bookmarked, so I decided to finally give one of them a try. I found this recipe on Cassie Craves, who adapted it from cooks.com. I think I was ultimately drawn to the simplicity of this dish. Mix a bunch of stuff together, stuff it into half of a squash, bake, and enjoy. And that is precisely what we did! This stuffed squash was very pretty, and delicious, to boot! I'd serve this to guests in a heartbeat. My halved version of the recipe is listed below. For the original recipe, please follow the links above. *I originally was going to buy a box of stuffing mix, since it was a favorite of mine growing up, but after looking at the sodium levels on the side panel of the box, we thought it would better to make our own stuffing with much less salt. We had 2 rolls in the freezer that I defrosted, ripped up, and allowed to get stale on a baking sheet overnight. Then, we chopped up some fresh parsley, sage, rosemary, and thyme, popped it into the oven for about 5-10 minutes to dry out the herbs, and voila...stuffing without the sodium!